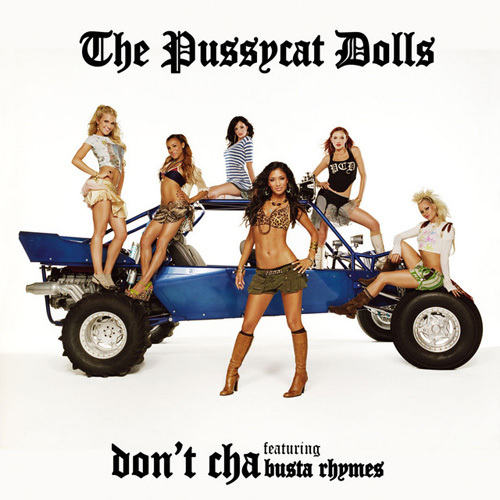 "Don't Cha" is a 2004 song written by Cee-Lo and Sir Mix A Lot. First recorded by Tori Alamaze in 2004, it was then a hit cover version in 2005 for the Pussycat Dolls and Busta Rhymes. It was the Dolls' second single after 'Sway' from their debut album PCD. The chorus of the song is based on Sir Mix A Lot's 1988 song "Swass" ("Don't you wish your boyfriend was swass like me?"). Tori Alamaze's 2004 single reached number fifty-three on the Hot R&B/Hip-Hop Songs chart. Writer/Producer Cee-Lo used the same backing track as the basis for The Pussycat Dolls' recording. The Dolls' single version (the 'radio edit') added a rap by Busta Rhymes and became a number-one hit in the United Kingdom, Australia, Canada, Germany and New Zealand and a number two hit in the United States.